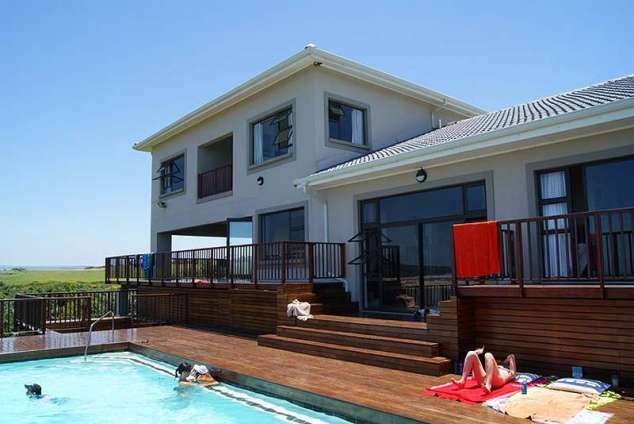 Agape Beach House - Tugela River Mouth Accommodation. This 12 sleeper is perfect for family or group getaways. Bedding and towels are provided and servicing is available on request. The fully equipped open-plan modern kitchen will suit any culinary enthusiast. There are four double en-suite bedrooms and a guest toilet. A television set is provided in the main bedroom. The living and entertainment area has a bar facility, pool table and large screen television with full DSTV access. Enjoy sundowners relaxing around the swimming pool or Jacuzzi on the partially covered deck, which has stunning sea views. A secure alarmed double garage as well as an electric fence and armed response for the property will ensure your peace of mind during your stay with us. Further secure parking is available on the property. Tugela Mouth is renowned for shore, river and boat angling. Salmon, Garrick, shark, shad, lobotes and a variety of other species are landed at various times throughout the year. Deep Sea Fishing Charters can be arranged through the local Ski Boat Club. Turtles and sharks provide worthwhile viewing as they enter the river to dispose of parasites. Prolific bird life abounds, with over 250 species identified in the area. Day trips to well-known game reserve's, or shopping malls are very convenient. Ballito which hosts a wealth of entertainment and the renowned Alberlito Hospital for emergencies is roughly half an hour away. The town of Mandini, 14 kms from Tugela Mouth will supply you with all your essentials as well as medical services and a pharmacy. 61134 page views since 27 Jan, 2011.